Jamaican Dogwood Liquid Extract, Jamaican Dogwood (Piscidia Piscipula) Dried Bark Tincture Features and description: NON GMO! Gluten Free! Highest Strength Jamaican Dogwood liquid extract! Jamaican Dogwood liquid extract contains ONLY natural ingr..
Japanese Quince Liquid Extract, Dried fruit (Chaenomeles Speciosa) Tincture Features and description: NON GMO! Gluten Free! We produced this extract using a cold maceration method of extraction to ensure that the broad spectrum of therapeutic plan..
Jasmine Liquid Extract, Organic Jasmine (Jasminum officinale) Dried Flower Tincture Features and description: NON GMO! Gluten Free! Highest Strength Jasmine liquid extract! Jasmine liquid extract contains ONLY natural ingredients! High Quality Jas..
Jewelweed Liquid Extract, Jewelweed (Impatiens Pallida) Dried Herb Tincture Features and description: NON GMO! Gluten Free! Highest Strength Jewelweed Tincture Supplement! 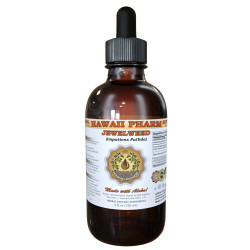 Jewelweed liquid extract contains ONLY natural ingredients! High Qu..
Ji Xue Teng (Spatholobus Suberectus) Tincture, Dried Roots Liquid Extract, Milletia Dielsiana, Herbal Supplement Features and description: NON GMO! Gluten Free! We produced this extract using a cold maceration method of extraction to ensure that t..
Ji Xue Teng Liquid Extract, Ji Xue Teng, 鸡血藤, Spatholobus (Spatholobus Suberectus) Stem Tincture Features and description: NON GMO! Gluten Free! Highest Strength Ji Xue Teng liquid extract! Ji Xue Teng liquid extract contains ONLY natural ingredie..
Jie Geng Liquid Extract, Jie Geng, 桔梗, Platycodon (Platycodon Grandiflorus) Root Tincture Features and description: NON GMO! Gluten Free! Highest Strength Jie Geng liquid extract! Jie Geng liquid extract contains ONLY natural ingredients! High Qua..
Jin Qian Cao Liquid Extract, Jin Qian Cao (Lysimachia Christinae) Dried Herb Tincture Features and description: NON GMO! Gluten Free! Highest Strength Jin Qian Cao liquid extract! Jin Qian Cao liquid extract contains ONLY natural ingredients! High..
Jin Qiao Mai Liquid Extract, Dried rhizome (Fagopyrum Dibotrys) Tincture Features and description: NON GMO! Gluten Free! We produced this extract using a cold maceration method of extraction to ensure that the broad spectrum of therapeutic plant c..
Jin Yin Hua Liquid Extract, Dried flower (Lonicera Japonica) Tincture Features and description: NON GMO! Gluten Free! We produced this extract using a cold maceration method of extraction to ensure that the broad spectrum of therapeutic plant comp..
Jin Ying Zi Liquid Extract, Dried fruit (Rosa Laevigata) Tincture Features and description: NON GMO! Gluten Free! We produced this extract using a cold maceration method of extraction to ensure that the broad spectrum of therapeutic plant compound..
Jing Jie Liquid Extract, Jing Jie, 荆芥, Schizonepeta (Schizonepeta Tenuifolia) Herb Tincture Features and description: NON GMO! Gluten Free! Highest Strength Jing Jie liquid extract! Jing Jie liquid extract contains ONLY natural ingredients! High Q..
Job's Tears Liquid Extract, Job's Tears (Coix Lacryma-Jobi) Grains Tincture Features and description: NON GMO! Gluten Free! Highest Strength, Super concentrated Job's Tears liquid extract! Job's Tears tincture contains ONLY natural ingredients! Hi..
Joint Support Liquid Extract, Joint Aid Herbal Dried Root Features and description: NON GMO! Gluten Free! Highest Strength Joint Support liquid extract! Joint Support liquid extract contains ONLY natural ingredients! High Q..
Ju Hua Liquid Extract, Dried flower (Chrysanthemum Morifolium) Tincture Features and description: NON GMO! Gluten Free! We produced this extract using a cold maceration method of extraction to ensure that the broad spectrum of therapeutic plant co..
Jue Ming Zi Liquid Extract, Jue Ming Zi, 决明子, Cassia (Cassia Obtusifolia) Seed Tincture Features and description: NON GMO! Gluten Free! Highest Strength Jue Ming Zi liquid extract! Jue Ming Zi liquid extract contains ONLY natural ingredients! High..
Jujube Liquid Extract, Jujube (Ziziphus Jujuba) Dried Fruit Tincture Features and description: NON GMO! Gluten Free! Highest Strength Jujube liquid extract! Jujube liquid extract contains ONLY natural ingredients! High Quality Jujube liquid extrac..
Juniper Liquid Extract, Organic Juniper (Juniperus Monosperma) Dried Berries Tincture Features and description: NON GMO! Gluten Free! Highest Strength Juniper liquid extract! Juniper liquid extract contains ONLY natural ingredients! High Quality J..